My giant zucchini that I picked from my garden today inspired me to try a new zucchini recipe. I have tons of zucchini recipes on my site that I rotate frequently but I’ve never tried baking bread with it. I found this recipe on Eating Well and reduced the sugar to 1 cup. This recipe replaced most of the fat with apple sauce so it’s low in fat, yet is very moist. If you don’t like nuts, you can replace them with chocolate chips. Spray two 8 1/2-by-4 1/2-inch loaf pans with cooking spray. Whisk all-purpose flour, whole-wheat flour, cocoa, baking powder, baking soda and salt in a large bowl. Whisk eggs, sugar, applesauce, oil, vanilla and melted chocolate in another large bowl until blended. Add the dry ingredients and stir with a rubber spatula until just combined. Fold in zucchini and walnuts. Pour the batter into the prepared pans. Bake the loaves 55 to 60 minutes, or until a toothpick inserted in the center comes out clean. Let cool for 10 minutes. Invert onto rack and cool completely. Awesome! Very moist and just chocolate enough. I halfed the sugar with Stevia, really good. I make this bread often. Does it work with 2 C of white whole wheat flour? This looks great, and I will be making it tomorrow! Quick question, though: do I have to squeeze the excess liquid out of the zucchini? Would this recipe work gluten free? Can I replace the two cups of wheat flour with all purpose gluten free or almond flour? Your site is wonderful. Thank you for making a much better cook. Love all these recipes!! I was wondering if you know the smart points value for this one? Just made this bread, but I swapped in 1/4c plain greek yogurt for the canola oil — a little got stuck to the pan and it tastes moist and delicious! I also have some pork for Banh Mi working in the crockpot right now! thanks for this amazing website!! LOVE this recipe. I just made them as muffins and left them on the counter. My husband who says he “doesn’t like zucchini” ate 4 of them and said they were the best chocolate muffins he’s ever had! Thanks so much Gina! Great recipe. My 4-year-old helped me make it this morning and both he and my 2-year-old loved it (me, too). We used chocolate chips and it was delicious. I wasn't able to fill two bread pans, though. I filled one half way and there was enough left for about 6 muffins. My son is already asking me to make this again. I assme I am still adding the ounce of chocolate, when I'm subbing the chips for the nuts right? Absolutely loved it! So glad I found your page! OMG I made this last weekend while my parents were visiting – everyone LOVED it! Even my mom who is super picky. It was so moist and flavorful!! Loved it!! I recommend making sure you have someone to share it with before baking, or you may eat it all by yourself. 😉 I will definitely make this again! Hey there! Love your site. I know this is an old recipe, I just wanted to let you (and anyone else who cares) know that I just plugged it into the WW Recipe Builder and it came up as 5 points+ per slice, with no substitutions – I did use chocolate chips instead of nuts, but the points plus were at 5 before I added them. I double-checked my ingredients list but will never rule out the possibility that I entered something incorrectly! Thanks! I used chocolate chips instead of nuts and omg it tastes like a chocolate chocolate chip muffin! So moist too. Genius. Gina-ius? I just update the nutritional info. How many calories, fat and carbs per slice? Delicious! Turned these into muffins instead and used chocolate chips instead of nuts due to allergies. I easily get 24 muffins which reduces the points to 3+ pts per muffin. Yum! Even my zucchini hating toddler gobbled them down and told everyone he got chocolate cupcakes for breakfast! I just smiled. Husband came home with GIANT ZUCCHINI from someone at work. This is in the oven NOW….. i used the bread loaves pan recommended, but they only filled 1/2. Hoping this wont effect baking time. Used 1/2 c sugar instead of 1c….. and 1 c spelt flour in place of w wheat. Anxious to taste when it comes out! *update* My sister tried it earlier and requested it for her birthday cake next month! I don't know if a person can get tired of hearing this, but you are awesome! I'm not on WW, but as the cook for the family, I've been trying to make healthier choices. I made this yesterday and the only change I made was using half sugar/half Splenda and I left out the nuts. It was fabulous. I'm actually thinking of making this my go-to recipe for chocolate cake. That is how moist and delicious it is. Up next, the turkey chili! 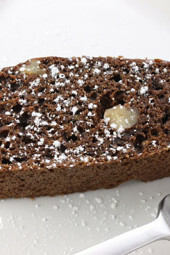 This recipe worked very good, I made mine with brown sugar instead of white and 1/2 mini chocolate chips instead of nuts and baked it as a large bunt cake instead of 2 loaves. I cooked it slightly hotter in a 350 oven for 50 mins and it turned out perfactly. I tried this recipe for the first time last night. It's already a HUGE hit in my family. I love the way applesauce moistens the bread and it's delicious with the chocolate chips. Thanks for such an amazing blog! This bread is so very good! It's a perfect delectable treat for me on my diet and my kids can't get enough of it. They love to help me make it and to eat it! I am going to try making this with pecan meal subbed for the white flour to try to reduce the carbs — my son has diabetes so low carb is better for him. Will drop a line and tell you how it went. I just plugged this into recipe builder on WW, but with my substitutions and it came out to 4 pts+ per serving (16 servings). Gina, is this with old or new WW points? Just made this tonight and it is fabulous. Served it with strawberries and FF whipped cream. Made me feel like I was cheating, but I wasn't!! Thanks, Gina! Love all the changes, don't you love happy mistakes! I always freeze my breads with great results. Does anyone know if this recipe freezes well? It's just me and the hubby – don't know if we could polish off two loaves that fast. Thank you so much for the recipe! Would love to know the ProPoints+ value as well. I added just one cup of zucchini and 2 bananas and made 32 small muffins. They turned out amazing! Definitely going to give it to my toddler as he refuses to eat veggies and bananas! Is this the old points value? Any idea what the point plus value is? Julie- It's great with chocolate chips!! I bet the boys had no idea they were eating their greens!! I have just found your website and really love it. I have already made a couple things that turned out great! I made these today in muffin form and gave them to 3 6 yr old boys as after school snacks. They loved them and one boy ate 2! Then my 9 yr old came home with a friend and they both loved them!! Thank you for the great recipes. I also have zuccini going crazy in the garden so I appreciate all the zuccini recipes! I tried this bread and it was great! Next time I will trade the nuts for chocolate chips and it will taste very similar to the giant chocolate muffins at Costco. It would be a lot less time, I would use the toothpick test once they look done. How long would I have to cook if I am making muffins? Thanks! No, it's 4 points per slice. Did I read that right? Basically 1/3 of a point per slice? I'm sorry for any confusion! This makes 2 loaves, 8 slices each. 16 slices total. Hope that clears things up. Ok..so I am confused too…is the recipe stating 2 loaf pans just a typo? I just found your blog and am so impressed with it. I'm sure I'll be coming here often. I have a question about this recipe though…does this recipe make 16 servings or 32 servings? Up above, Laurie stated that each loaf is supposed to be sliced into 16 slices, but at the top of the recipe it says this recipe makes 16 servings. Two loaf pans would make 32 servings if I'm reading this correctly. I'm a little confused. Thank you in advance for clarifying this for me…I am very excited to try this recipe out. It sounds delicious. Just made this recipe, using the chocolate chips instead of nuts, as you suggested. So yummy! I know the kids will be excited. My first two attempts (other recipes from other sites) didn't go so well. This one is perfect. Just the right amount of sugar and moist but not mushy. Thank you Gina! This recipe is a keeper and is going in my recipe box! This was the best zuchinni bread I've ever had! My kids ate it like it was cake too. Gotta love that! Great idea to sneak veggies in your kids muffins! I saw a recipe for zucchini cookies I want to try next week. If they come out good, you will see them here. Making this recipe as mini muffins for the kids…anything to get veggies into them!!! Only a few more minutes!! Thanks for the great recipes, Gina. I used your recipe the other night and made these as muffins and they just disappeared! @The Apple Hill Adventurer – The bread fell right out of the pan. It's very moist. I sprayed the pan with Pam first. @ hungrynez – You could probably substitute yellow squash. @anonymous – Baking is a science so I'm not sure what wil happen if you replace the eggs with egg beaters. I've replaced eggs before and had good results and bad, so you would have to test it. Replacing the eggs wouldn't change the points much, it's less than a half a point per slice. As far as the sugar, I'm sure using the Splenda blend would be fine. @fattymcbutterpants- not really, with the eggs it totals .375 points per slice. PERFECT! i have been searching out a chocolate zuke recipe, and you have provided ! was the baked bread easy to remove? i know some lower fat recipes get stuck in the tin quite easily, i really want to use a bundt mold, but not if its a bit of a crumbley bread 🙂 i will opt for muffin tins if so! Do egg beaters lower the point value any? Can you make further substitutions such as replacing the whole eggs with whites or egg substitute and using splenda instead of sugar? I'm unsure sometimes whether it won't work, or if for some reason you don't take the substitutions further. I just made these and used egg beaters in place of eggs and used Splenda sugar blend instead of sugar. The batter tasted delicious! hello! i happen to see your site. nice bread. great photos. but i wonder what zucchini is coz we don't have those in our country. any substitute i can use? thank you so much! 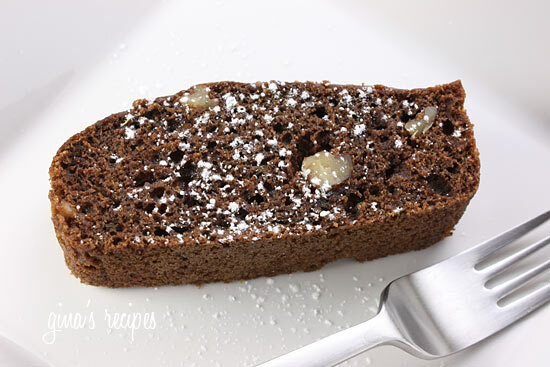 I Love me so zucchini bread and this recipe sounds delicious. I love the idea of adding a chocolate! You read my mind. I have a huge zucchini sitting on my counter that I've been wanting to make zucchini bread with it. I'm going to try this recipe.